Back in my scathing review of 2015’s American Sniper – which is, at least in my opinion, one of worst films ever nominated for Oscar’s biggest prize (I’ve tried to rewatch it twice and have never gotten past the 30 minute mark) – I held nothing back on Clint Eastwood’s remarkably lazy storytelling, suggesting that the past-his-prime filmmaker should fold up the director’s chair and call it a day. Since then he’s made Sully, which is in and of itself a puzzling crapshoot, as well as his latest drama The 15:17 to Paris. At this point, Eastwood’s fascination with adapting and worshipping everyday heroes has come full tilt, actually allowing the same real brave men to play and portray their own selves. This isn’t a movie; it’s a laughable recreation that’s somehow even less believable than one of those sketchy true-crime reenactments that plays late at night or early in the morn. Carelessly edited as if it has an indistinguishable split personality and directed with absolutely no guidance from Mr. Eastwood, The 15:17 to Paris is as tone-deaf and shockingly dull a picture as the year has been burdened by thus far. In this substandard piece of propagandist military recruitment, the “film” attempts to lull its audience into a self-serving and nationalistic point of view, offering up the bare minimum in order to tempt us into volunteering for the country’s goodwill. Troubled and bullied outsiders are eager to prove themselves and to redefine their images. And in one of the most tasteless scenes I’ve come across in recent memory, we watch as our youth are energized by the discovery of AR-15 air-soft guns in the back of the closet. The recollection may be true, but that doesn’t make its intentions any less deranged or hapless given current events. If anything, the picture reinforces a close-minded sense of thinking. 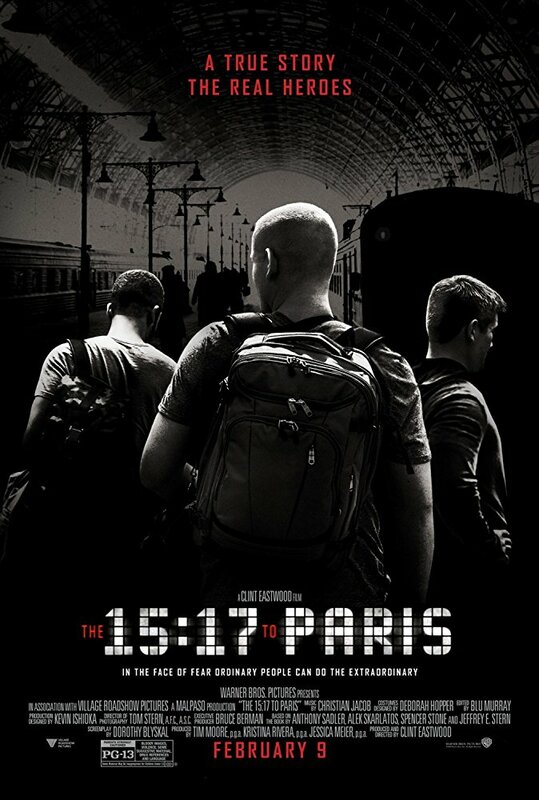 For moviegoers eager to watch a listless, lifeless, eager to please feature-length film about the eponymous events, The 15:17 to Paris will likely disappoint, largely because the bravery is merely a blip on the radar. While less jingoistic than I anticipated, the movie wanders like a landlocked seafarer, a vagrant with no real final destination or planned path. We meet little kids who can’t act a single bit (they admirably try), see them transform into men who aren’t any better on the screen (they try even harder), and follow them around through a backpacking Eurotrip full of all the quintessential tropes you’ve come to expect. The 15:17 to Paris has all of these poorly placed pivot points, as well as no structure. Combine the dubious power of the distanced direction, the utterly lifeless performances, and the incredulous dialogue all together and the movie still sails its failing trifecta wide right of the goal posts. Are these three men heroes? The record accurately declares that Spencer Stone and Anthony Sadler and Alek Skarlatos deserve to be called patriots. Are these three men actors? Not in the least. By casting real people as themselves, Clint Eastwood simultaneously exploits and undermines the creative process of filmmaking, lavishing praise onto people who somehow come to feel inorganic to their own experiences as a byproduct and, just as readily, diluting their heroism into a clickbait form of punch for the masses to thoughtlessly drink up. I’m 100% confident that I will see worse movies over the remainder of the year, and yet I don’t think I’ll watch another fledgling film that’s as bizarre, as horrifically written (note to Dorothy Blyskal: people DO NOT talk this way), or as physically feeble as The 15:17 to Paris.